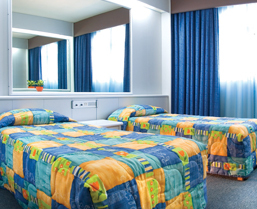 Club Riza provides a uniquely friendly and tranquil atmosphere with easy access and high standards of cleanliness. Guests can enjoy the many on-site facilities which include indoor and outdoor pools and Jacuzzis, sauna and spa facilities, fitness room, snooker room, bar, restaurants and a launderette. This is an established holiday destination with a great choice of bars, cafes and nightlife. Small rocky beaches and the picturesque harbour of St. Paul’s Bay are within walking distance. 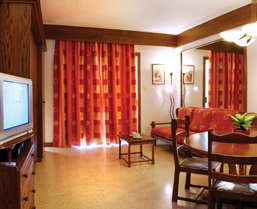 The resort is much in demand by holiday guests and has excelled at achieving many Hospitality Awards. The 68 spacious self-catering apartments are spread over three floors and are built around attractive outdoor pool areas. Almost all have sun terraces allowing full enjoyment of the best sunshine records in Europe. The units are comfortable, all are air-conditioned and centrally heated, and all have a fitted kitchen, direct dial telephone and free cable television. Club Riza is located at Qawra Bay close to the sparkling, blue Mediterranean Sea. Enjoy the northern area of the island with its popular sandy beaches such as Mellieha and Armier Bay, which are within a short driving distance of Club Riza. These offer a wide range of sports and leisure facilities, which include scuba diving and snorkelling. Alternatively, the centre of the island is within half an hour’s drive and here you can visit ancient tombs and temples, see the catacombs of the early Christians and enjoy the wealth of history from the medieval Knights of St. John to the World War II exploits that earned Malta the George Cross. Nowhere is ever far in Malta. A bus stop is within walking distance from the resort.